Component: Components are factors that, individually and collectively, contribute to the good operations of the enterprise’s governance system over IT. Components interact with each other, resulting in a holistic governance system for IT. Processes, Organisational Structures, Policies, Competencies are some of the examples of Components. The governance and management objectives in COBIT are grouped into five domains. Evaluate, Direct and Monitor (EDM) domain groups the governance objectives. In this domain, the governing body evaluates strategic options, directs senior management on the chosen strategic options and monitors the achievement of the strategy. Management objectives are grouped in four domains. Align, Plan and Organize (APO) addresses the overall organization, strategy and supporting activities for I&T. Build, Acquire and Implement (BAI) treats the definition, acquisition and implementation of I&T solutions and their integration in business processes. Deliver, Service and Support (DSS) addresses the operational delivery and support of I&T services, including security. COBIT is a comprehensive framework that covers Governance , Plan, Build, Run stages of IT. COBIT is set of control objectives that can be audited. COBIT does not specify any implementation guidelines, practices or tools. 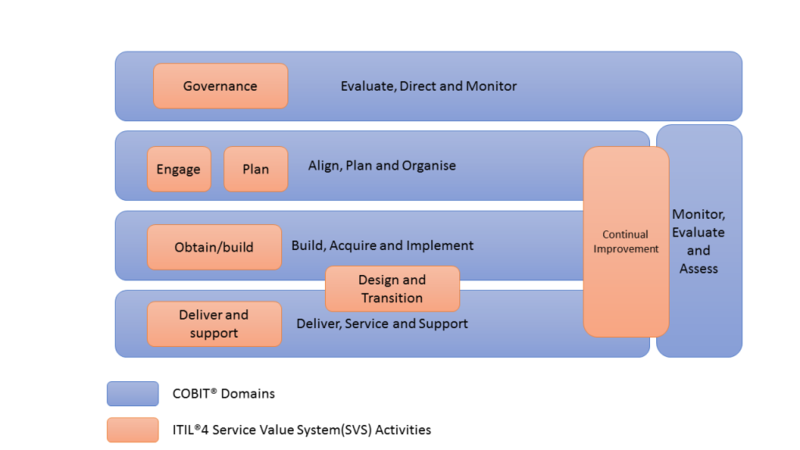 The organisations often chose a lower level framework to implement COBIT’s control objectives. COBIT is first released in 19961 and celebrated its 20th anniversary in 2016. COBIT has been periodically updated by the sponsoring organisation ISACA.2. It is one of the widely adopted framework for organisations pursuing IT Governance. The rating 4 given is because there is no legislative or regulatory requirements in Australia to enforce COBIT in Government or financial sector. COBIT is tool agnostic.There are multiple tools required to govern and manage IT guided by COBIT framework. ISACA provides extensive training support and assessment support for COBIT.